Japanese Foreign Minister Taro Kono will pay an official visit to China from January 27 to 28 upon invitation. Q: The US and Vietnam announced yesterday that a US aircraft carrier will make the first visit to Vietnam since the end of the Vietnam War in 1975. This announcement comes during the visit by the US Defense Secretary James Mattis to Vietnam. Is China concerned about the prospect of a US aircraft carriers visiting Vietnam? A: China has always been pleased to see the development of normal friendly and cooperative relations among nations. We will not object to the military exchanges between Vietnam and the United States as long as they are normal and conducive to regional peace and stability. Q: We have noticed that during the World Economic Forum Annual Meeting this year, attendees have heatedly discussed the economic prospects of China and its contribution to the world economy. Considering that the theme of this annual meeting is "Creating a Shared Future in a Fractured World", what do you think of China's role in promoting common development and building a common future for the world as the second largest economy? A: These days the world is focusing on Davos. The World Economic Forum (WEF) is an important platform for China to contribute to the development of the world. I believe the international community still remembers President Xi Jinping's keynote speech at the WEF annual meeting last year. President Xi evaluated the world economy and came up with his prescription, gave an in-depth analysis of global pressing problems and put forward major proposals to promote the rebalancing of economic globalization, which still has broad and far-reaching influence in the international community. China's contribution to the development of the world is embodied in many aspects. China's economic growth has injected a strong impetus into the world economy. In 2017 alone, China's foreign investment reached 120 billion US dollars and it imported goods worth 12.46 trillion yuan, which provided a vast market and ample investment and development opportunities for all countries. It is safe to say that China is the stabilizer and engine of the world economic growth. China provides popular public goods for international cooperation. China's Belt and Road Initiative is one of the most popular international public goods for today's world, pointing out new directions for improving global governance and providing a new model for international cooperation. The first Belt and Road Forum for International Cooperation hosted by China last year has produced more than 270 fruitful outcomes. China is committed to providing solutions to the world's problems. We have been attaching great importance to implementing the 2030 Agenda for Sustainable Development, actively responding to the challenge of climate change and making remarkable progress in pollution prevention and treatment. Last year, 10 million people in China were lifted out of poverty. By taking these concrete actions ,China has made tangible contributions to meeting global challenges and realizing common development. At present, China's economy has shifted from a phase of rapid growth to a period of high-quality development. We believe this will surely provide more and more positive energy to the common development of the world and the building of a common future. Q: Western intelligence officials say that shipping records show the DPRK ships have been involved in shipping coal from the DPRK to Russia in breach of Security Council resolutions. There is also evidence that Chinese ships were involved in shipping coal from the DPRK to Russia. Are you aware of the involvement of any Chinese ships in this trade? If you are aware, what measures are you taking to prevent it? A: I am not aware of that. China's position is very clear. We hope that the UN Security Council resolutions on the DPRK will be fully and earnestly implemented. We will not allow any Chinese enterprise or individual to engage in any violation of Security Council resolutions. If there is solid evidence that relevant Chinese enterprises or personnel are engaged in activities that violate the resolutions, the Chinese government will certainly deal with that in strict accordance with the laws and regulations. promote an early start of political dialogue between relevant parties and push for a peaceful and proper settlement of the Korean nuclear issue. Q: We have noticed that the Information Office of the State Council published a white paper titled "China's Arctic Policy" this morning. Why did the Chinese government choose to publish a white paper on China's Arctic Policy for now? 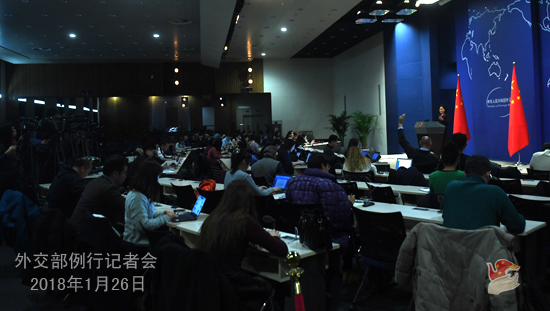 A: This morning, Vice Foreign Minister Kong Xuanyou gave a detailed briefing on the main contents of the White Paper on China's Arctic Policy and China's Arctic policies at a press conference held by the Information Office of the State Council. The White Paper on China's Arctic Policy is the first Arctic policy document issued by the Chinese government. It identifies China as a "key stakeholder in the Arctic affairs", decides the four policy goals of "understanding, protecting, utilizing and participating in the governance of the Arctic", sets forth the four basic principles of "respect, cooperation, win-win results and sustainability" and expounds five specific policy proposals. It is a programmatic document to guide China's engagement in the Arctic at present and in the future. The Chinese government's White Paper on China's Arctic Policy was published as a natural result of ripe conditions. First of all, the formulation of China's Arctic policy is based on practices. Since the 1990s, China has substantively taken part in the Arctic affairs and carried out various Arctic activities extensively, and has become a major country in terms of engagement in the Arctic. In practice, China has gradually formed its position, proposition and common practices in specific areas of the Arctic affairs and has the basic conditions for summing up the Arctic policies and positions. Secondly, the introduction of China's Arctic policy is out of the need of the China's Arctic work. As the number of Chinese entities participating in the Arctic affairs keeps rising with increasingly rich activities, it is pressing to strengthen policy guidance. Third, an early introduction of China's Arctic policy is the expectation of the international community. It is the common practice for countries to set the Arctic policy and to regulate and guide the Arctic activities. China's neighboring countries such as Japan, the Republic of Korea and European countries including the non-Arctic ones like the UK, France, Germany and the eight Arctic countries have all released the Arctic policy documents. Likewise, the international community also hopes that China will roll out its own Arctic policy as soon as possible. In addition, there is a good atmosphere now for China to roll out the Arctic policy. China has held bilateral dialogues or consultations on Arctic affairs and established good cooperative relations with all Arctic countries and most major countries that engage in the Arctic. Therefore, the introduction of the Arctic policy is conducive to strengthening exchanges and cooperation with the countries concerned. So to speak, the publishing of the White Paper on China's Arctic Policy is only natural as conditions are already ripe. 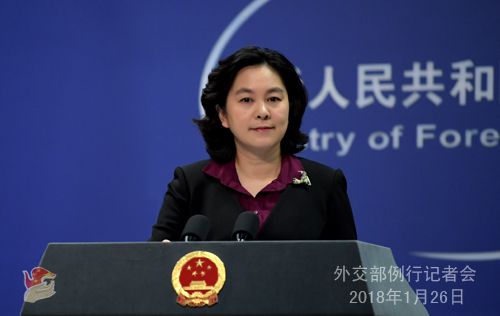 We believe that the publication of the White Paper will be conducive to stepping up the norms and policy guidance for China's activities in the Arctic and will help the international community to gain a more comprehensive and accurate understanding of China's relevant policies and propositions. It will also be conducive to promoting pragmatic cooperation between China and all relevant parties as well as maintaining and promoting peace, stability and sustainable development of the Arctic. Q: About Chinese investment overseas, as the Chinese government funds start being invested increasingly in other countries in the world, for example through the Belt and Road Initiative, especially in developing countries, some human rights groups or NGOs in the West have expressed concerns that in some of these projects, environmental and human rights considerations are not properly being taken account of, and China is giving the money with no strings attached. Is the Chinese government aware that such concerns exist? How does the Chinese government deal with such concerns? A: Are you asking about a specific project or just in general terms? Follow-up: Some of the attendees of the Davos Forum this year and some organizations like the Greenpeace and Human Rights Watch expressed the concerns that China just gave out these funds to projects without conditions, compared to the funds that come from the World Bank or the Asian Development Bank which might have conditions attached, like improving governance, protecting human rights, protecting the environment. A: Since you made a general reference, I will give you a principled reply. Indeed, in recent years, more and more Chinese enterprises have been investing overseas and making important and positive contributions to the local economic and social development. The Chinese government requires enterprises that go global to carry out their business activities in accordance with the law and regulations within the legal framework of the host country and actively fulfill their social responsibilities. For example, the Belt and Road Initiative we proposed in itself contains the content of building the Green Silk Road. These have been welcomed and approved by all sectors of the host countries. In fact, there are many typical examples of mutual benefits and win-win situations like this. We stand ready to make joint efforts with other countries and continue to create a favorable environment for promoting friendly, equitable and win-win cooperation. Q: According to Japanese media reports, the Japanese government opened a territory and sovereignty exhibition hall in the Municipal Research Building in Chiyoda-ku of Tokyo, trying to publicize Japan's so-called territorial claims. What's your comment? A: Diaoyu Dao and its affiliated islands have been inherent territories of China since ancient times. China's sovereignty over Diaoyu Dao has solid historical and legal grounds. China expresses strong dissatisfaction with Japan's move. I would like to stress that such behavior will by no means change the objective fact that Diaoyu Dao belongs to China. China's determination to uphold its territorial sovereignty over Diaoyu Dao is unwavering. Q: Former US Secretary of State Henry Kissinger on January 25 called for an agreement on the future of the Korean Peninsula through the revival of the now-stalled six-party talks or a separate forum led by the US and China. That, he said, would be the best road to the denuclearization of the Peninsula. He also said that he does not believe the DPRK will abandon its nuclear weapons in exchange for a suspension of US joint military exercises with the ROK, and the suspension-for-suspension proposal will not be advanced. What is your comment? A: China values all efforts that are conducive to peacefully resolving the Korean Peninsula issue through political and diplomatic means. We've said many times that the essence of the Peninsula issue is about security, which means that the legitimate security concerns of all parties shall be addressed through dialogue in a balanced way. Sitting at the core of the Peninsula issue is the contradiction between the DPRK and the US, which means that the DPRK and the US, as two parties directly concerned, shall have contacts and dialogues. The six-party talks may be mired in difficulties, but that framework is still very important. The key is how to resume it. 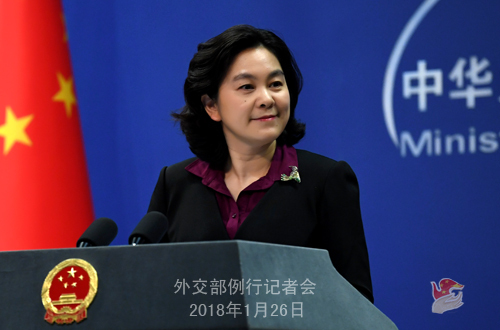 The suspension-for-suspension proposal and dual-track approach China raised last year were meant to find a breakthrough to the stalemate and build bridges and break new grounds for dialogues to happen. We hope that the DPRK, the US and relevant parties could seize the opportunity presented as the DPRK and the ROK restored talks, and engage in bilateral and multilateral dialogues by lowering the threshold and taking synchronized and small steps, so as to create favorable conditions for the next-stage efforts to properly resolve the issue through political dialogues and realize enduring peace and stability on the Peninsula. Regardless of the forms in which the talks may take place, we stand ready to give positive thoughts to all constructive ideas that will help alleviate tension and resolve the issue through dialogue. Q: First, US President Donald Trump said the United States can consider returning to the TPP. What is China's attitude towards the TPP? Is it possible for China to join in the future? Second, what is China's expectation of Japanese Foreign Minister Taro Kono's visit this weekend? A: On the first question, we noticed the relevant report. China has not participated in the relevant TPP process, but its position on relevant issues is consistent and clear. We believe that all countries in the Asia-Pacific region should adhere to the principle of openness, inclusiveness, shared benefits and win-win cooperation so as to jointly push forward the process of the Asia-Pacific Free Trade Area and promote new progress in the economic integration in the Asia-Pacific region . On your second question, this will be Foreign Minister Kono's first visit to China since he took office. Foreign Minister Wang Yi will hold talks with him to exchange views on the China-Japan relations and issues of mutual concern. This year marks the 40th anniversary of the conclusion of the Treaty of Peace and Friendship Between China and Japan. At present, the relations between China and Japan maintain a momentum of improvement while also facing challenges. It is hoped that this visit by Foreign Minister Kono will implement the important consensus reached by the leaders of the two countries and promote the continuous improvement and development of China-Japan relations.